The cause of this week's migraines: the very real possibility that my Mother is trying to kill my Father. It happened last Sunday evening, when these things always happen. Mum ‘accidentally’ left a pan of olive oil on the hob. We were all minding our own Gin and Tonics when a strange smell sifted through the flat. Before you could say Tanqueray Ten the kitchen was filled with noxious plumes of billowing black smoke. Being the man of the house my Dad raced into the kitchen to take the pan off the hob before it caught fire, but he forgot to hold his breath, so coughed, which meant he inhaled the noxious smoke. Fatal mistake. A little history about my Dad – he is a bionic man. He’s had pneumonia 8 times in 18 months, he has a folded lung from Asbestos exposure in the Royal Navy, in 2008 he had part of a lung removed, he’s had 15 general anesthetics, there is scarcely a part of his body that hasn’t been replaced. Six months ago he had an operation on his stomach, he’s just had skin cancer removed from his face, and this is the man, the one recovering from pneumonia, who inhaled the smoke. Uh oh. 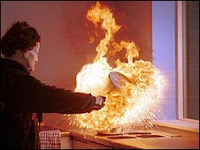 Did you know that what usually kills people in fires isn’t the flames but the smoke? But we all thought nothing of it. Dad gave us a lecture on fire safety, opened every single window and door to fumigate the flat and Mum continued to cook the traditional Sunday Roast. Though, and this is the big clue, while she was stirring the gravy she looked at Dad and said nonchalantly, “Darling, when did you say your life insurance was up?” Do I need more proof that she’s up to something??? Anyway, next morning it became apparent that Dad had suffered pretty serious smoke damage to his lungs and sinus. We whisked him off to his lung specialist who considered admitting him to hospital. Dad came home, however, inhaling steroids, on all sorts on drugs and with lungs that seemed to rattle with each breath and with the worst cough you ever heard. Mum ‘claimed’ to feel terribly guilty. I banned her from the kitchen as my suspicions grew. But what does all this have to do with migraines? I’m just about to get to that. So, my Agatha Christie obsessed brain was already working overtime. I felt a shadow of one of my less usual right-sided pounding migraines, which I hate, so took a cocktail of drugs and hoped that a good nights sleep would prevent the migraine from kicking in and from having to take any more Triptans. Taking too many Triptans (acute migraine medicine) can, conversely, often lead to migraines and give you what is called Medication Over Use Headache. In essence they actually give you a migraine if you take too many. It’s not fair I know. Anyway, I was in a beautifully deep sleep when suddenly I was awoken by the sound of Dad violently coughing up blood. I then heard Mum cry, “Call Victoria!” In my over active Writer’s imagination this meant my poor Dad was coughing up pints of blood and the “Call Victoria!” was my now remorseful mother realizing she had gone too far and that I was required to call the ambulance, that was urgently needed to save my Dad’s life. Had she stabbed him? In one swift movement that surprised even myself (honestly, it was like one of those slow motion sequences out of Mission Impossible) I leapt out of bed, grabbed my phone, turned on the lights, pulled on my glasses and my pink fluffy dressing gown (just like Tom Cruise) and raced into my parents' bedroom. My fingers had already started to dial 999. But what I found was not a room splattered in blood and lungs, but my Dad sitting comfortably on the edge of the bed, coughing yes, and my Mum sitting next to him tenderly patting his back. It turns out she had in fact said, “Can’t you go and cough in the bathroom so you don’t wake up Victoria”. A Mother’s love knows no bounds. I think Dad had told her to piss off. But there had been no mention of ambulances or anything. No blood. But, the second I had done my Mission Impossible leap out of bed move, it felt as if someone had punched me in the right side of head. I’ve never had a migraine onset quite as fast and quite as violent. I guess it was a combination of being woken so suddenly, and jumping up so violently (it has nothing, whatsoever, to do with having a completely overactive, hysterical imagination that will win me Oscars one day!) If I had had an uninterrupted nights sleep the two days of right-sided migraine would not have developed. As it was, I stood in my parents bedroom, realized that no one was dying, and the massive right sided pounding took hold and I fell onto the bed next to Dad who resumed his hacking cough. I explained to Mum what I’d thought had occurred. She did feel genuinely bad and spent the rest of the night nursing both me and Dad. So the moral is two-fold: do not leave heating olive oil unattended and, if you get migraines, keep to a regular sleep pattern! Mere anxiety had not been my migraine trigger this week and you would be guilty of Migrainism* for making that assumption (for it often takes a lot more than simply being ‘anxious’ to trigger a migraine) though one can be forgiven for being nervous about potential murder. Interrupted sleep caused this week’s spiral of migraines. Disturbed sleep patterns are a well-known cause of migraine. Too much sleep, too little sleep; it’s a minefield. Office workers often get migraines at the weekend when they have a lie-in. If you listen to the following radio interview by Pain Concern you will hear the Medical Director (who wears a Bow Tie) of the National Migraine Centre talking about this phenomenon, as well as a sufferer explain the role sleep plays in his migraines. (P.S this is also a really great general over-view on migraines with some handy tips, listen to it!) 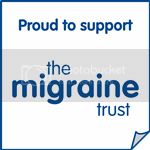 This month's edition of the Migraine Trusts magazine ‘Migraine News’ also has an interesting article about sleep and migraine. Talking of loving Mums, this radio interview also features a lovely American Mother who regularly gets three-day migraines. She has two small children and they’ve worked out a system where the kids make scrapbooks and take photos of what they’re doing during the week so they can re-live the events she’s missed when her migraines have gone. This kind of brought tears to my eyes. I think this woman, whoever she is, is truly amazing; so humble and uncomplaining. I also think that the level of pain and disruption to her life is unacceptable. I wish I could help her, I wish someone could help her. Migraines should not be allowed to cause this much disruption! End of rant. *Migrainism or being a Migrainist is when you treat someone differently because they suffer from migraine. Now sleep and routine is something I always struggle with. All the doctors always bang on about how migraineurs need to keep to a routine, eating at the same time. sleeping at the same time, exercising regularly etc etc but I find that very hard when the migraines come so often. How do you cope with it? When I have a migraine, all I can do is lie down and try and sleep so then when I recover, I have problems sleeping so then am tired again which can trigger a migraine and the vicious cycle starts again. Plus, I'm on Topamax which I see you're on too. Has it made you really tired? I find it really hard to get out of bed in the morning. I start to think, am I just lazy? But then I remember I am someone who a few years ago would regularly get up at 6am and go swimming before work. So how do you find it? Anyway, I could go on for ages about all sorts of things - exercise, rant about useless doctors etc but I'll leave it for another time! Now you have hit upon the main problem of my life! Well nearly. This vicious cycle plagues me! Only a couple of weeks ago I went to my GP in tears pleading for sleeping pills, trying to explain the importance of regular sleep for migraineurs and you know what she did - she printed out some rubbish leaflet from the internet about sleep relaxation exercises!!! So I then looked up the BASH guidelines (link on the side) that suggest Diazepam and sleeping pills can be useful to aid a migraine patient at the start of a migraine, which I know is different - but every little helps. The person who helped me the most with this was actually my physiotherapist as my back is a huge part of my problem. She made me keep a weekly diary of when I went to bed, the exercise I did, and encouraged me to get up at the same time every day. But as you point out this is often impossible if you've had a migraine start at 4am, or one start in the afternoon - it totally ruins any pattern. Sometimes I've tried to then get up at 7.30am but have lit been shaking and felt sick and realised my body just needs sleep so gone back to bed but then made myself get up and try to go for a walk or swim walk, get fresh air and then try to go to bed at a 'sensible' time in the evening - and try not to panic that I'm out of kilter. I try to think of it like jet lag - how can you get back to the right time cycle as quickly as possible. Melatonin pills? Yoga? Power naps - but not too long. But I do think that the odd sleeping pill to encourage the body back into a sleep pattern can help, but obviously everyone is different. My physio is very fierce and says you should get up at the same time every morning no matter what but sometime it's just impossible and I think you should just listen to your body. Re Topamax, I'm relatively new to it - but I'll blog about it soon so maybe we can chat more about it then? I'm still on a very very low dose and on the granule, sprinkle formula so I can increase my dose at my own pace. I'm still on a relatively tiny dose (45mg) and don't plan to increase until the side effects I've noticed have gone....so I'll report back! Have you thought about decreasing your dose? What do your docs say? And now I feel tired so will take this chance to try and sleep! My main tip however, is audio books - I swear they keep me sane, I shall be blogging about this at length! Good to know you experience the same problems I do (but wish neither of us did). I recently got sleeping pills but have only tried them once so far. They didn't seem to help that much but will probably try again at some point. My GP was very reluctant to prescribe them warning about their addictive properties but I told him I wasn't planning to use them daily and they were only for emergencies so he gave in. The following day, it was reported in the news how sleeping pills reduce life expectancy by 4 years or so! This kind of sensational science news reporting is something I could rant on about at length as normally the facts aren't reported properly or grossly over exaggerated and all it does is scare normally already anxious people (every time there is a 'pill causes cancer' story the number of unwanted pregnancies goes up, because women stop taking the pill without thinking about how the pill actually protects against many types of cancers). Anyway, sorry have totally digressed but meant for you not to worry about the sleeping pills. Wow, can't believe they started you on such a high dose of Topamax, my favourite book on Migraines "Conquering Headaches" (theres's a link in Tried and Tested) is an American Book and they recommend starting off on 15mg so would assume same would apply in Canada? I take the 'Sprinkle 15mg hard capsules' which I could pull apart. Anything with 'sprinkle' in the title can not be scary. As I mentioned going very, very slowly so only side effects are a bit of rage and dying of thirst, tingling hands, I'll elaborate in next post! Sorry to hear you've had such a tough time - again I just can't believe they didn't start you off on 15mg? Re Sleeping pills - I've found you need to find the right brand. I like the UK equivalent of Ambien, and the right dose. I swear some sleeping pills actually keep me awake! Also, I think they're not a magic 'pass out' pill - you have to take them at 9pm, be in 'going to bed' mode, in pi's, trying to relax etc. Same with Diazepam. Obviously, I only really take either of those when I'm getting a very bad headache. Um. Again, I told my Doc it was for emergency use. Mum actually just gave me some Rescue Remedy Night Pills...taste nice but doesn't do much. But I'm in that vicious cycle again as had a migraine at 3.45am on Sunday, had to get up to take a Zomig, so didn't actually get dressed till 6pm yesterday though I deep keep trying to get up. But then I do stupid things like look ta dream holidays online until midnight instead of going to sleep. But to prove to you that I can take my own advice, as I don't have a headache I made myself get out of bed at 7.30am this morning (it's currently 7.44) even though I've been awake since 6am. I guess when I don't have a migraine I try to imagine I have a full time job - i.e be dressed and ready to go by 9am, get to bed by a sensible hour. My amazing rehab physio says it takes your body about 3/4 weeks to 'absorb' this rhythm so when it's disturbed with migraines you can slot back into it faster. Though I do so understand how side effect/migraines can make this very hard. I'm now going to write a legal note as I don't want anyone joining in our conversation half way through to think I'm addicted to sleeping pills and valium. Legal Note: All views expressed are based on my own non medical opinion and experiences and should not replace the view of qualified medical practitioner. You should not take any of the medications mentioned without consulting your doctor. You make a great connection, broken sleep is not good for migraineurs at all. Thanks so much for starting this blog, it has been very helpful and enlightening! I've been diagnosed with vestibular migraine and take 30mg of Amitriptyline every night which has helped alot (though gaining weight is a really crappy side effect). I don't really get as many headaches as others do, though I've had my fair share. Mine is more the dizziness (vertigo), nausea, tiredness, tinnitus, hearing loss, loss of balance, fatigue, lightheadedness to a point I'm not sure whats going on around me. For example I was on the tube in London the other day on my way to Queens square. The train had just stopped at Kings cross on the picadilly line the next stop was mine, I dont remember it stopping there though. I found myself two stops further than I should of been, I know I hadn't dozed off and if I'm honest it scared me abit. Another example is when I'm in a conversation with someone I seem to zone out without realising, not because the conversation is boring either! I've been tested for BVVP, menieres etc. It's taken over 4 years to come to a diagnosis. I've cut out certain trigger foods like cheese and caffiene which has helped dramatically. Though I still haven't been discharged from one of the hospitals I have been going to, as they are worried that my condition might lead to Menieres disease. My hearing in one ear changes quite alot where as my other ear the hearing in my lower register has become worse, will see. The reason I wanted to comment though was because of the sleep discussion. It's definitely a domino effect. I either get tired because i've just had a bout of dizziness, this will then make me need to take a nap, if thats the case I have a problem sleeping that night. Or I'll take my medication which I have to take a few hours before sleep otherwise I won't wake when I need to the next day, but because of this, it means that I start to fall asleep alot earlier than I want to. Or if I've had a bad nights sleep where I can't seem to stay asleep then I get a headache or some or all the symptoms thats listed above. Or even if I had a really good sleep maybe going over the 7 hours that seem to be my bodys limit then I get some or all the symptoms. Definitely a vicious circle. Hi Gina, Vestibular Migraine is a bugger! I used to suffer badly from it - even had an inner ear operation because it was misdiangosed - also used to go to Queens Square - did lots of vestibular rehab which I'm sure you're doing at the moment. For me, because my neck was involved that was a big part of my balance issue and treating that has really helped my vertigo. 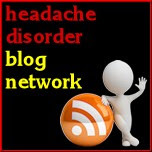 BTW - have you read the blogs I've put up this week (6th) - Annie has vestibular/basiliar migraines and gets very similar symptoms to you - those 'absences' and blanks you're talking about. If you leave a comment I'm sure she'll reply, so scary indeed. I wish more people realised how truly disabling migraines can be.